With the arrival of fall another season has arrived: soup season! I am a huge fan of soups, partly because of their convenience, but the problem with canned soups is that they’re very high in sodium. So I challenged Preston and I to make our first homemade soup this weekend, and we’re both very pleased with how it turned out. We were inspired by a recipe that I found on FoodNetwork.com, which we adjusted according to our preferences. 1. Place the clams and 1 cup of water in a large pot. Cover and place over high heat until the clams are cooked (about 5 minutes). Strain the liquid from the pot through a strainer, reserving the clam juice for later. 2. Finely chop the clams and reserve for later. 3. Heat the olive oil in the bottom of the clam pot and toss in the bacon. Cook the bacon over medium-high heat, until the bacon is brown and crispy. 4. Toss in the onions and garlic. Cook until the onions are soft (about 5 minutes). 5. Add the potatoes, and salt and pepper to taste. Cook for another 5 minutes. 6. 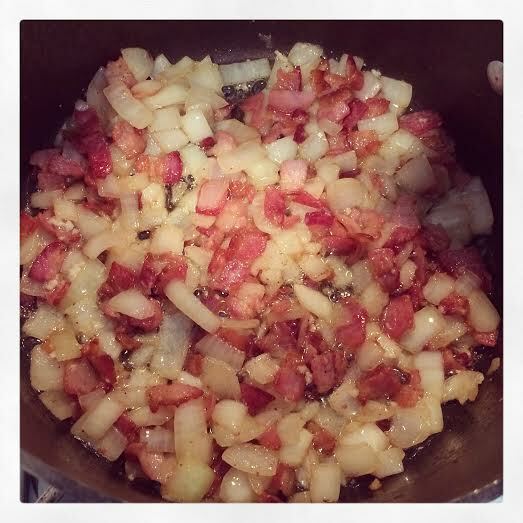 Sprinkle the flour over the onion, potato, and bacon mixture and stir to combine. 7. Gradually whisk in the reserved clam juice, then whisk in the milk and heavy cream. Add the bay leaves and rosemary. Add salt and pepper according to personal taste. 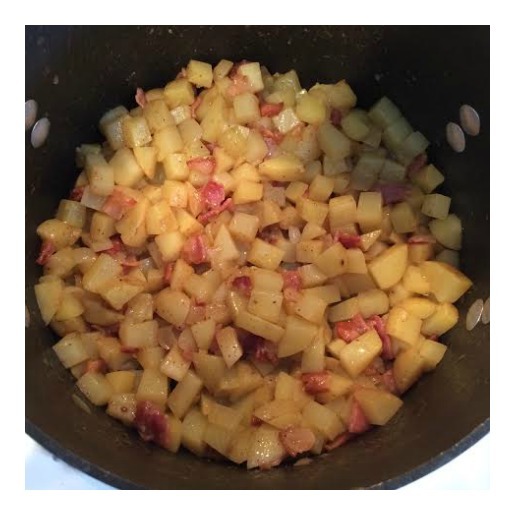 Bring to a boil, then reduce to simmer until the potatoes are cooked through (about 10-15 minutes). 8. Toss in the reserved clams. Taste and re-season if necessary. 9. Cook on simmer for at least one hour before serving, stirring every 15-20 minutes. The longer it simmers, the more the flavors will blend together. We served the soup alongside a salad and a warm baguette. It was the perfect low key weekend lunch, and we made enough soup that we had leftovers for lunch during the week. QOTD: What is your favorite soup? This entry was posted in Food and tagged cooking, healthy eating, recipe, seafood, soup. Bookmark the permalink. One of my favorites is tortilla soup, but this looks amazing. My husband’s favorite is either clam chowder or seafood chowder. He would like to be invited to your house to taste this! 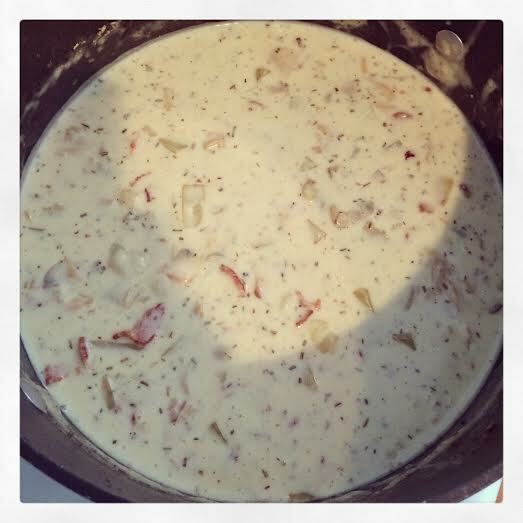 My family loves chowdah, but I’ve never been a big fan of clams. I love making soup in cold weather season! 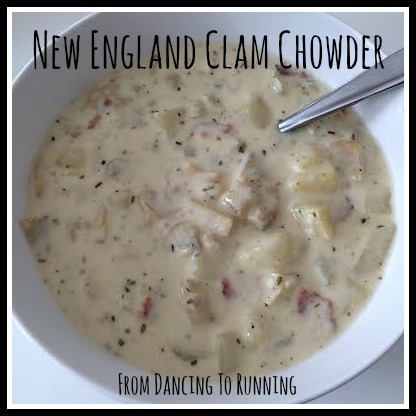 This looks great – I love New England Clam Chowder. Broth based – I love French Onion or Miso soup. Cream based – I love Tomato Basil and Broccoli Cheddar soup. Okay, now I want to make all of those soups! That looks delicious Kathryn!!! One of my favorite soups in the winter is taco soup! Yum! I might have to make that soon! Oh I love New England clam chowder. Manhattan not so much. Love the creaminess of the New England kind. I’m not a Manhattan fan either. I love making soups when the weather turns. I made a huge batch of cheddar corn chowder (also from Food Network) before one of our ice storms last year. Not only does it make awesome leftovers, but I can freeze a lot of it to put out later in the winter. My most favorite ever is this chicken tortilla soup my husband makes or Maryland crab, but I LOVE NE clam chowder during the winter months! Total comfort food. This recipe sounds awesome!